Don't get me started on unlabeled old photographs; it's one of my bugaboos. I strongly suspect this is a portrait of Howell Cobb Davis 1851 - 1921. He looks about fifty so I am guessing this portrait was made around 1901. Whoever he was this man was important to my great-grandmother Minnie Raver. This is one of her oval framed portraits that hung on her walls until her death. After Minnie's death, my grandmother Hazel stashed the portrait in her hoarder's basement until her death. Then my mother stashed it in her hoarder's storage closet until her death. When I got ahold of it the frame was gone but the image was still too curved to scan with a flatbed. This is a macro shot of the curved print. Howell was the father of Minnie making him a great-great-grandfather. 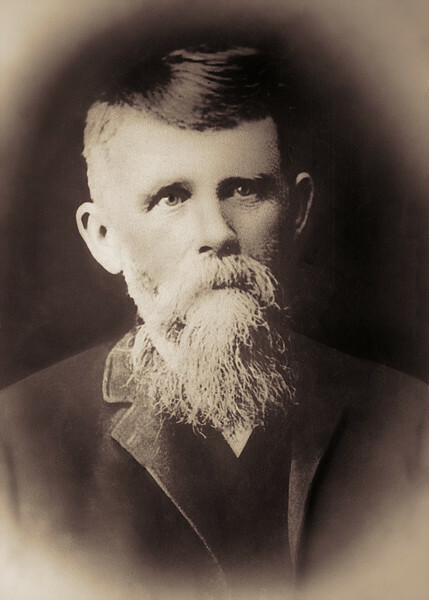 The only thing I know about Howell is that he moved his family in a wagon from the south (Georgia) to Montana after the US Civil War. Apparently, he made Minnie walk most of the way to lighten the load for the draft animals. According to my mother, Minnie complained about her forced march for decades afterward.